Adafruit's 9DOF (9 Degrees of Freedom) breakout board allows you to capture nine distinct types of motion or orientation related data: 3 degrees each of acceleration, magnetic orientation, and angular velocity. 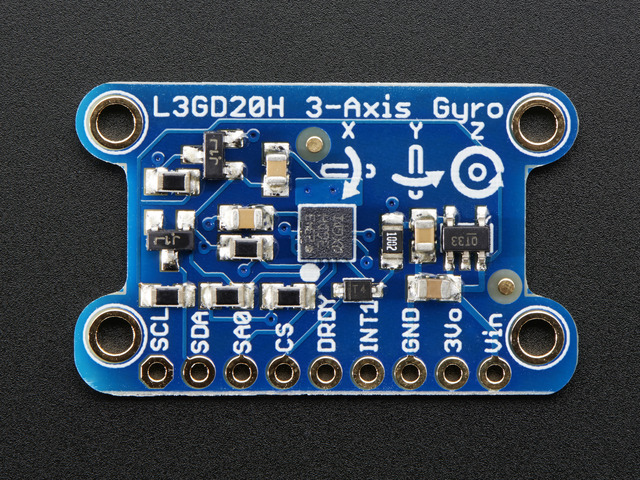 If you also want barometric data, check out the Adafruit 10DOF breakout, which adds a BMP180 barometric pressure sensor to measure altitude and temperature. 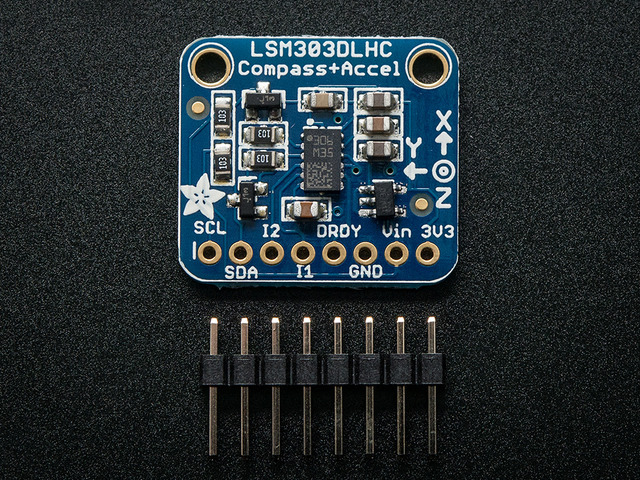 The Adafruit 9DOF board and library reuses the existing Adafruit drivers for the LSM303DLHC (accelerometer and magnetometer) and the L3GD20 (gyroscope). This breakout is basically just a smooshed together version of both of these so anything you can do with those libraries/guides will follow here. Start by breaking the header down so it is 10 pins long. Sometimes we toss in a longer strip, but its easy to break it down, just use pliers or diagonal cutters to snap it down to 10 pins. Place the long ends of the header into a solderless breadboard to keep them steady. Heat up your soldering iron and once it is ready, solder all 10 pads to the header, making sure to check that there is plenty of solder to make a mechanically strong connection and there's no solder bridging either. We'll be using an Arduino UNO here, but the code will work on a Mega or Leonardo just fine. Most other Arduino compatibles should have no problems either but we only support official Arduinos for code. That's it! With those four wires, you should be able to talk to any of the I2C chips on the board and run any of the example sketches. These pins are all outputs from the 9-DOF breakout and are all 3.3V logic, you can use them with 5V or 3V as 3.3V registers 'high' on 5V systems. Like other breakouts on Adafruit, the 9 DOF Breakout is fully level shifted, and you can safely use it on 3V3 or 5V systems. This function reads the LSM303DLHC accelerometer data (supplied via the 'event' variable), and converts it into equivalent pitch (x) and roll (y) values, populating the supplied 'orientation' variables .pitch and .roll fields accordingly. This function populates the .heading field in mag_orientation with the correct angular data (0-359°). Heading increases when rotating clockwise around the specified axis. This function uses the accelerometer data provided in accel_event to compensate the magnetic sensor measurements in mag_event to compensate for situations where the sensor is tilted (the pitch and roll angles are not equal to 0°). // Do something with the compensated data in mag_event! This guide was first published on Feb 07, 2014. It was last updated on Feb 07, 2014.